Site finished hardwood floors are hardwoods that arrive unfinished on the site, installed, and finally sanded and finished. Preferences for site finished flooring include a smooth, gap free, non beveled final appearance. 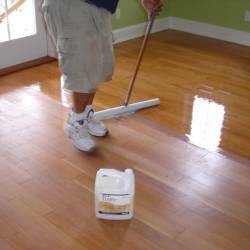 This type of application has been more of a traditional choice since floor sanding machines became available for use in the 1920's. Shown on the right includes some white oak unfinished flooring being shipped from one our our suppliers. Next, an unfinished American Walnut being installed in the library of a Pelican Landing resident. The floor was eventually finished with three coats of satin. Also shown is edging being done in the Audubon subdivision of North Naples. Edging is a procedure that sands the perimeter of the floor or where the larger sanding machines cannot reach. Other advantages with site finished floors include choosing the type of gloss level you prefer. Most all prefinished manufacturers offer only one finish sheen on their individual products and product lines. Looking to achieve a color match with cabinetry? This is another advantage with unfinished flooring. The majority of unfinished hardwood floors are 3/4" in thickness. Considering most of our homes in Florida are constructed with concrete subfloors, solid 3/4" products are ruled out in many cases, unless one chooses the plywood subfloor method. Disadvantages are noted on this resource page. 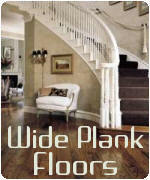 An excellent alternative to solid 3/4" unfinished flooring is Owens Plank. Owens offers a high quality unfinished engineered product available in Maple, Red Oak, White Oak, Hickory, American Cherry, American Walnut, and Brazilian Cherry. We chose the Owens Plank for our showroom as it offers the best alternative to solid unfinished flooring. In our opinion, the benefits exceed solid hardwood flooring in several ways. Check out our start to finish review of the Owens plank in our showroom, or stop in today and take a look at our showroom floor personally.